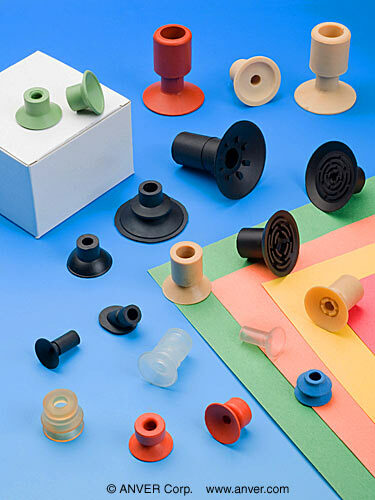 A full line of vacuum suction cups that are molded from natural gum rubber and elastomer blends for use with a wide variety of packaging and paper processing equipment is available from ANVER Corporation of Hudson, MA. ANVER Paper Suckers are molded from natural rubber, TPU or nitrile and can be compounded to meet specific paper handling applications. Designed not to attract ink or paper dust from cutting operations in manufacturing labels, packages and cartons, a variety of styles and gripping surfaces for handling all types of flexible and rigid materials are available. Featuring cleats on the bottoms to eliminate puckering or smooth bottoms for more rigid materials, along with various orifice sizes and neck types, depending upon the airflow and flex requirements, ANVER Paper Suckers are offered in sizes from 1/4” O.D. up for flange or push-in mounting. Hundreds of standard size and style combinations and custom designs are offered.